Cover page for the Atlas of the Cartographic Landscape. Preliminary research map showing the path of study taken, a non-linear, non-hierarchical route of study and engagement. The idea that cartography and landscape design share similarities is shown through visual examples of iconic maps. 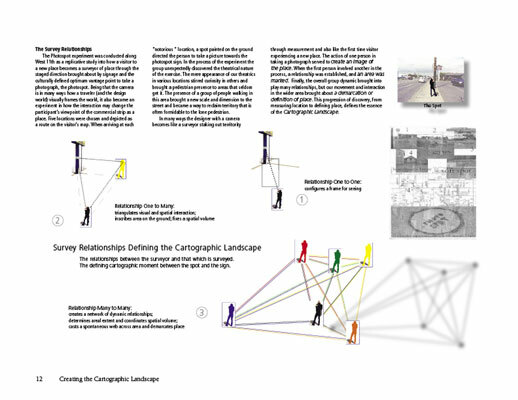 Diagram showing the engagement in the field of a photographer (surveyor) studying place. 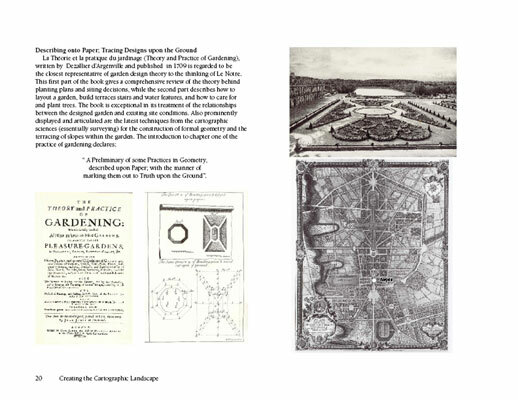 Visual overview of the genesis of the French garden through cartographic theory and practice. "Confident and innovative. Incredibly precise work building on a platform of previous educational experience." 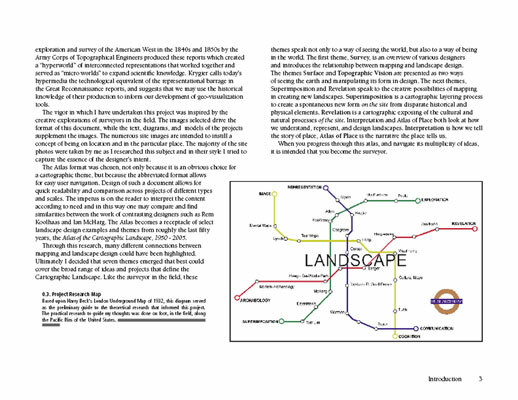 This project evolved out of my personal inquiry into the relationship between landscape design and cartography. 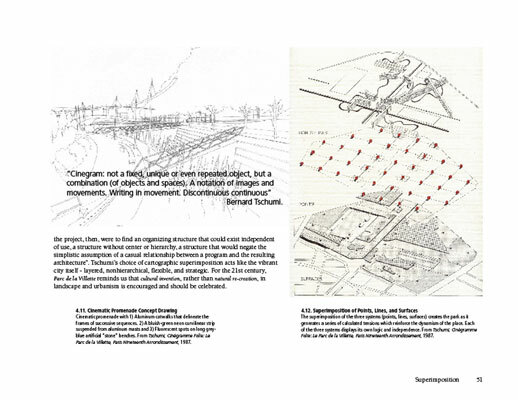 What started out as an intuitive sense that my previous career training and experience in cartography was influencing my designs and ways of envisioning landscape architecture became the basis for a wider historical study into the converging lines linking the two practices. This research is the result of many different experiences of mine over the course of the past several years. During this time I have been engaged both in the pursuit of a professional degree in Landscape Architecture and the strengthening of my cartographic skills through work done in the geography department's InfoGraphics lab at the University of Oregon. 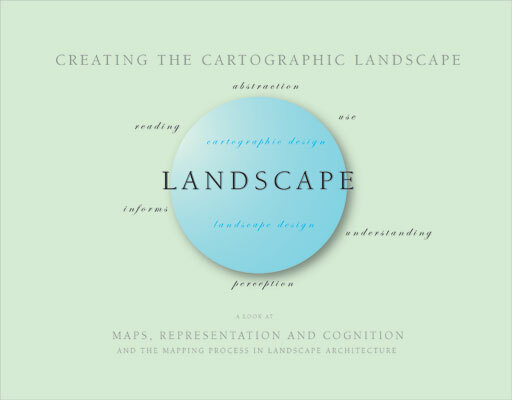 Being involved in both disciplines concurrently, I soon came to the realization that there were at times only narrow separations between the way my peers in Landscape Architecture were grappling with how to design the land and how my coworkers in the cartographic sciences were contemplating how to depict the land. The vigor in which I have undertaken this project was inspired by the creative explorations of surveyors in the field. The images selected drive the format of this document, while the text, diagrams, and models of the projects supplement the images. The numerous site images are intended to instill a concept of being on location and in the particular place. The majority of the site photos were taken by me as I researched this subject and in their style I tried to capture the essence of the designer's intent. The Atlas format was chosen, not only because it is an obvious choice for a cartographic theme, but because the abbreviated format allows for easy user navigation. Design of such a document allows for quick readability and comparison across projects of different types and scales. The impetus is on the reader to interpret the content according to need and in this way one may compare and find similarities between the work of contrasting designers such as Rem Koolhaas and Ian McHarg. 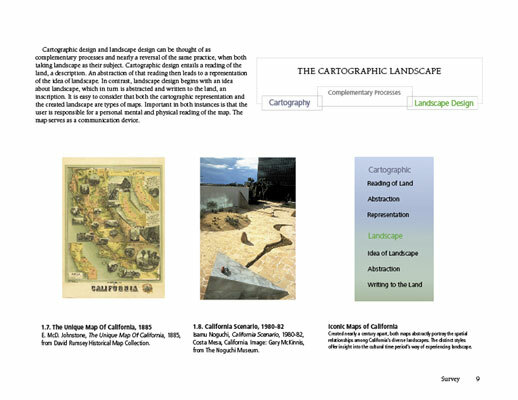 The Atlas becomes a receptacle of select landscape design examples and themes from roughly the last fifty years, the Atlas of the Cartographic Landscape, 1950 - 2005. Through this research, many different connections between mapping and landscape design could have been highlighted. Ultimately I decided that seven themes emerged that best could cover the broad range of ideas and projects that define the Cartographic Landscape. Like the surveyor in the field, these themes speak not only to a way of seeing the world, but also to a way of being in the world. 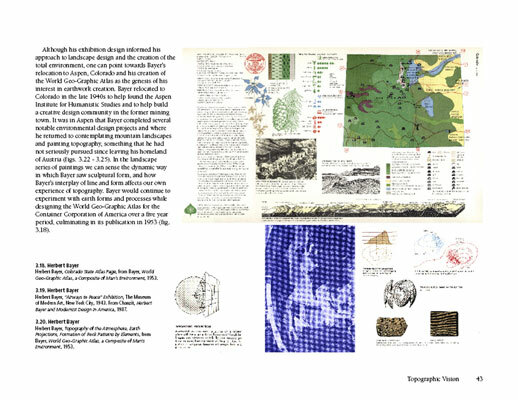 The first theme, Survey, is an overview of various designers and introduces the relationship between mapping and landscape design. The themes Surface and Topographic Vision are presented as two ways of seeing the earth and manipulating its form in design. The next themes, Superimposition and Revelation speak to the creative possibilities of mapping in creating new landscapes. Superimposition is a cartographic layering process to create a spontaneous new form on the site from disparate historical and physical elements. Revelation is a cartographic exposing of the cultural and natural processes of the site. 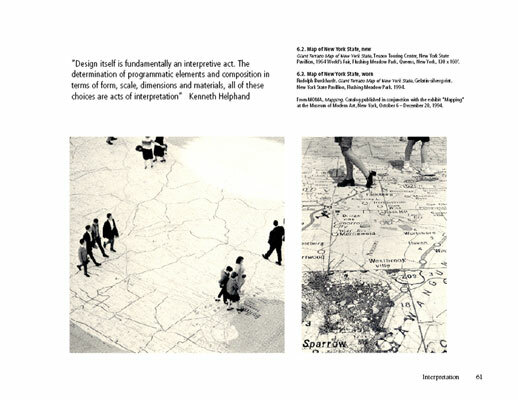 Interpretation and Atlas of Place both look at how we understand, represent, and design landscapes. Interpretation is how we tell the story of place, Atlas of Place is the narrative the place tells us. When you progress through this atlas, and navigate its multiplicity of ideas, it is intended that you become the surveyor. A collection of maps, diagrams and interpretive design by Herbert Bayer that influenced his landscape earthworks. The cartographic layering process as theorized by Bernard Tschumi. Two maps of New York portraying the idea of the cultural map and formation of place that we create by walking through space. 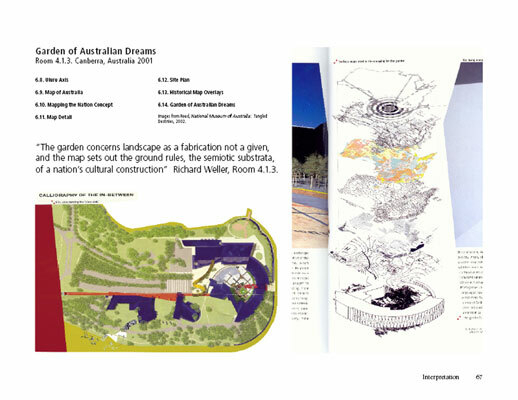 Overview of the Garden of Australian Dreams. 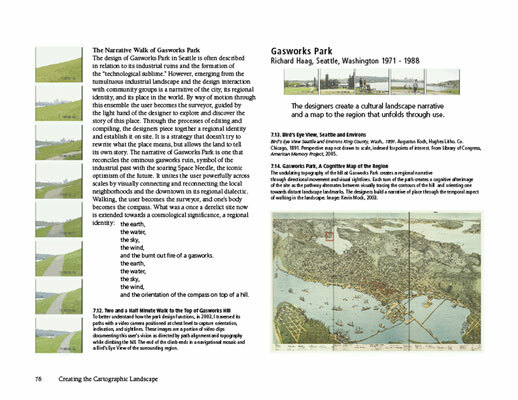 The cultural map of Gasworks Park unfolds itself through experience on site.